While migrating from Microsoft Exchange 2010 to Exchange 2016 we came upon a typical issue in which Outlook keeps giving the message: “The Microsoft Exchange Administrator has made a change that requires you quit and restart Outlook“. The reason for that was quite obvious (at least after we did some research and thinking) as we switched the Client Access from the old Exchange 2010 servers to the newly implemented Exchange 2016 servers, i.e. all client connections have been directed to Exchange 2016 only. 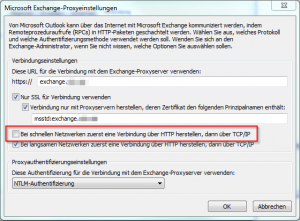 As no mailboxes have been migrated at this point in time client connections need then to be down proxied to Exchange 2010 by Exchange 2016. All things considered it could only have been a question of the protocol being used by our Outlook 2010 clients. 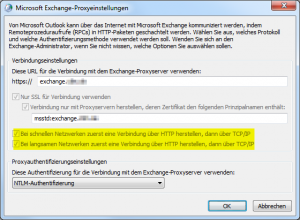 Assuming that our Outlook 2010 clients try to connect via RPC-over-TCP (as is the default setting configured in all internal Outlook 2010 profiles) this is an expected behaviour as Exchange 2013 and later no longer support RPC-over-TCP connections from client applications. They only support RPC-over-HTTP, in later versions MAPI-over-HTTP (MAPIhttp). An automatic switch in protocol to RPC-over-HTTP does not occur, thus Outlook 2010 won’t find a valid connection end point and cannot be down proxied to Exchange 2010. The importance of this consideration is that if Outlook clients are using RPC-over-TCP prior to being migrated, it becomes even more important to have a process to update those profiles properly. This is the traditional (internal) direct-to-Exchange connection also known as a “RPC over TCP” connection or as a (not entirely technical correct) MAPI connection. 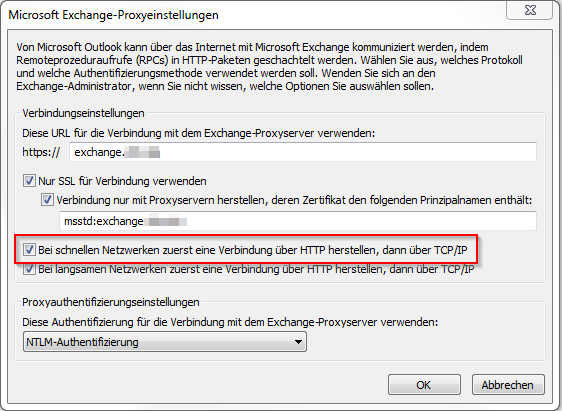 This is the over-the-Internet connection introduced in Outlook 2003 also known as a “RPC over HTTP” connection and nowadays knows as “Outlook Anywhere”. 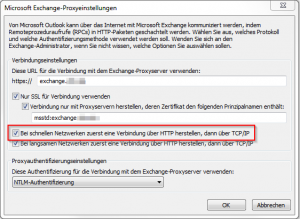 As of Outlook 2013 SP1 in combination with Exchange 2013 SP1, this is a MAPI over HTTP connection or simply: MAPI/HTTP. The description for the HTTP connection doesn’t really hold true anymore as the HTTP connection can also be used internally. In fact, over the past few Exchange versions, the trend was to move away from the direct RCP connections and towards HTTP connections, even internally. 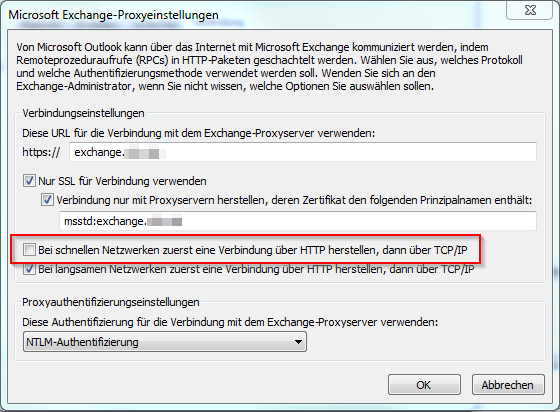 Actually, as of Exchange 2013, all Outlook connectivity is taking place via Outlook Anywhere. Now, in order to rollout such a configuration change on a large scale (after careful testing of course!) 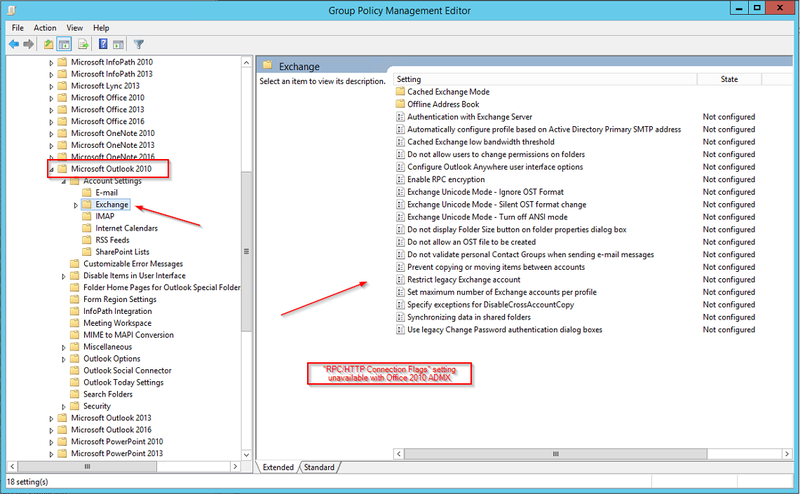 you could utilize GPOs by either configuring the corresponding Outlook setting or by using GPP and manipulating the user’s registry settings directly. Please keep in mind that this setting is unavailable with Office 2010 ADMX. 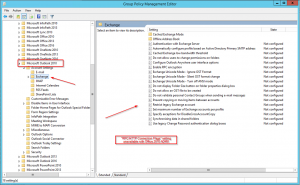 With this configuration adjustment we were able to proceed with the Exchange 2016 migration without having any Outlook 2010 connectivity issues.